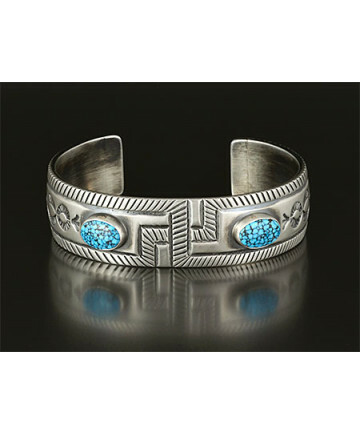 Sterling silver cuff bracelet set with 2 Kingman turquoise cabochons by Allison Lee (Navajo) Allison "Snowhawk" Lee was born in 1958 in Mexican Springs, New Mexico on the Navajo Reservation and is a member of the Beneath the Wings Clan. He was given the last name Lee while at boarding school because his Navajo name couldn't be translated. His interest in jewelry making was sparked in the early 1970's when his mother and uncle started making jewelry. 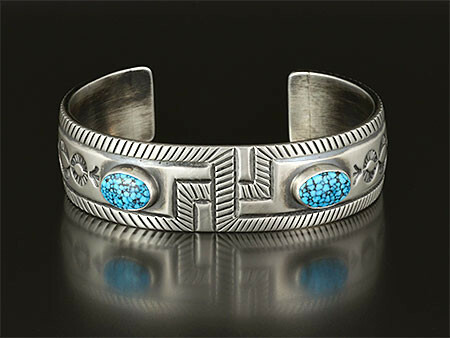 During his high school summers he worked for various jewelry shops in Gallup, New Mexico where he learned jewelry making techniques from the silversmiths working there while sweeping floors and doing other general work. He has gone on to win numerous awards and has also taught 2 of his 3 sons the art as well. This bracelet measures just over 1/2 inch wide by 6 inches inside circumference. Wrist opening measures 1 1/4 inches.